I have owned and camped in an older Gunnison 4 for about 5 years. Last week, I camped 5 days in it in Gulf State Park (Gulf Shores, Alabama) with a companion and 2 small dogs. The trip reminded me of the things I like about the tent and the things I dislike about it. 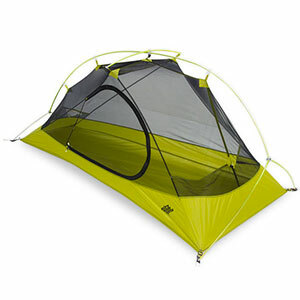 Overall, it is a very good tent for lightweight camping. It is not too heavy (my tent weighs 8 pounds, 11 ounces but the newer model weighs several ounces less), packs into a reasonably small space, and has lots of room (8.3 feet long by 6.8 feet wide). I am 6'3" tall and we both use 25" wide sleeping mats. Nevertheless, we were able to stretch out and still have ample room for the two dogs. The two side doors made it easier for each person to enter and exit the tent without bothering the other person. And the tent with its rain fly holds the heat well. The inside of our tent was comfortably warm all night when the temperatures dropped to about 50 degrees. Neither of us had to sleep inside our sleeping bags. During the trip, we were reminded of three limitations of the tent. First, the tent is not ventilated as well as it should be. As a result, the underside of the fly was soaked on the nights when we zipped the fly closed. The two vents at the top of the tent seem too small to be effective in humid climates. Consequently, we got soaked when we exited the tent. We prefer tents with fly zippers that are curved at the top so that we can adjust the size of the vent as large as needed. The second limitation was the zippers. Although they did their job, they required hard pulling to close and open. We know that zippers on well-made tents should operate much more smoothly. The third limitation has to do with the door height. When the rain fly was off or both sides of the vestibule were pulled back, we were able to easily enter and exit the tent. But when one side of the fly was staked out to make half a vestibule, the door height was much lower. Consequently, we had difficulty entering and exiting the tent. I know exercise is good, but contorting my 63 year old, overweight body to get through the door got to be a little aggravating before the trip was over. Weight: 5 lb. 3 oz. The tent is very strong and well made. It was very easy to set up and held up very well in an all day wind and rain storm. I've seen these tents selling for over $200 on the net, I bought mine for $165.95 at http://basecampsupply.com. I highly recommend the Kelty Gunnison tent! Our family of four (2 adults and 2 children - 10 & 11 yrs) purchased this tent just prior to a two month cycle tour through Spain in the spring of 2008. 1. The size proved ideal for our family's needs. We wanted to tour with a single tent and I have to say that this proved very comfortable throughout the two months. There was enough width for all of us to sleep without disturbing anyone else and there remained sufficient space on either side to stow gear and sort things out. The height of the tent was great although it did catch the wind. The dual vestibules were also a high priority for cycle touring. 2. 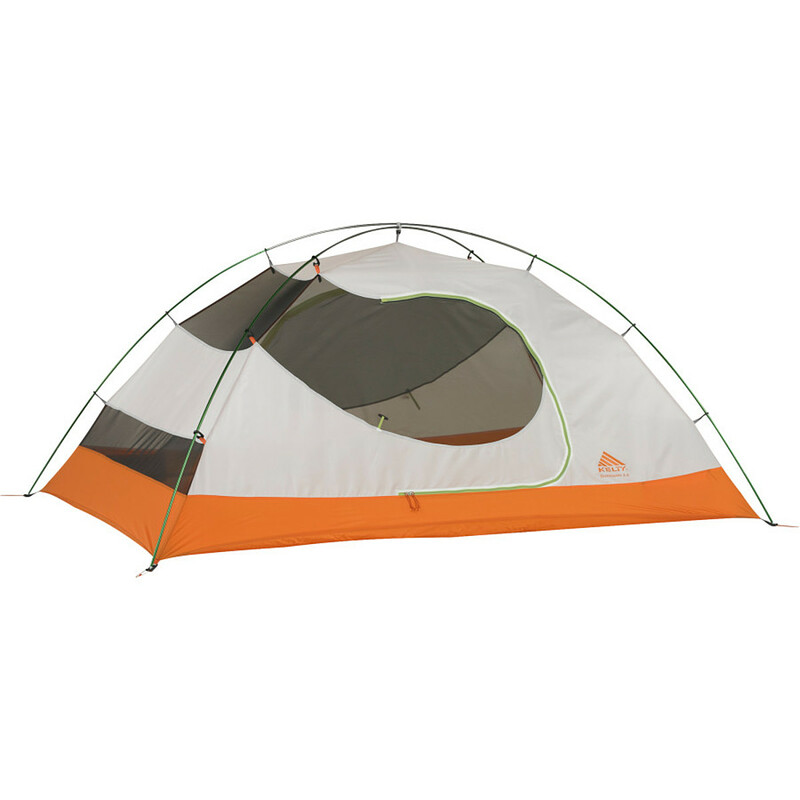 At eight pounds this tent is light for its size and that is perhaps one of the three most important criteria we considered prior to purchasing. 3. We managed to pick it up through an ebay seller, and at 150$ it is a real bargain. 1. Aside from what I have already mentioned, the tent did keep out the rain. We experienced only a couple good rainstorms, nonetheless the interior stayed dry (not even any splash under the fly). Note however that when we pitched it on wet ground the water pushed right through the flooring and a groundsheet is a necessity for wet conditions. 2. The set up is a snap and even setting up in the rain it goes up so quickly that you can keep the whole thing reasonably dry. 3. The vestibules are a standard size for this model tent and provided ample storage for all our bags (four panniers, a trailer bag and 30L dry sack). One hesitancy I have about this design for a vestibule is that you really cannot leave it open under ever the slightest rain. Reaching for the zipper requires longs arms if you are to avoid getting wet from the condensation in the morning. 1. I initially found the fasteners that hold the corners of the tent inner to the poles to be a bit weird. They are a molded plastic and although they held up admirably, I am not sure what the idea is behind the design as opposed to a length of webbing with a couple of grommets into which the pole is inserted. 2. The plastic hooks that suspend the tent inner on the poles have a weird twist to them, and even after two months I am never became adept at unhooking them with any level of dexterity. I have definitely seen much more simple designs out there. 3. While light, the poles are not strong! The first wind storm left us with two cracked poles that we had to baby throughout the rest of the trip. I was guying every point down on even the calmest night. 1. The noise! While a good fair weather tent (which many are) as soon as the wind came up it sounded as though I was inside a cellophane bag of potato chips. The noise of the fly rubbing against the poles and/or hooks was intolerable. At first I couldn't figure out what the heck the noise was believing that it originated from outside in the trees or something of the like. Three nights of little to no sleep was finally remedied with earplugs, however even then the noise was only cut down not out. I have slept in many tents under windy conditions, and while all tents are noisy, this one is beyond anything I have encountered. 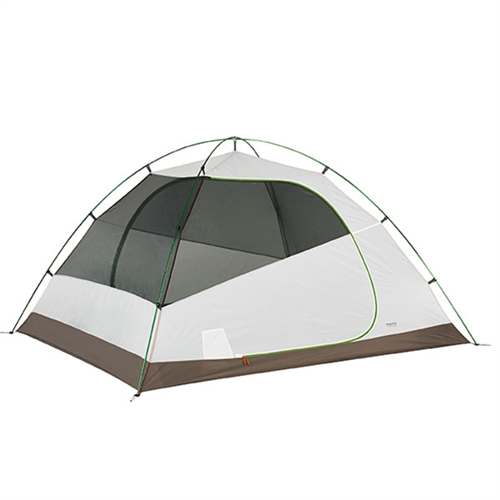 If you turn the tent 90 degrees and sleep length-wise - at 100 inches - this tent is the ultimate tall-man tent. Each person gets a vestibule and even an extra long sleeping bag doesn't touch the tent at head or toe. I have two of these tents - one for me and my wife and another for the kids. 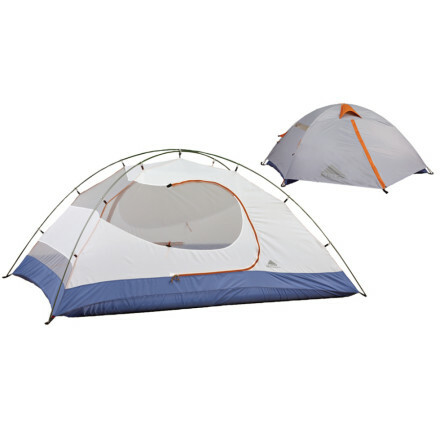 This tent is quite roomy for two tall or large adults or 4 kids. I've had a Gunnison for 6 years now. Best tent I've owned. 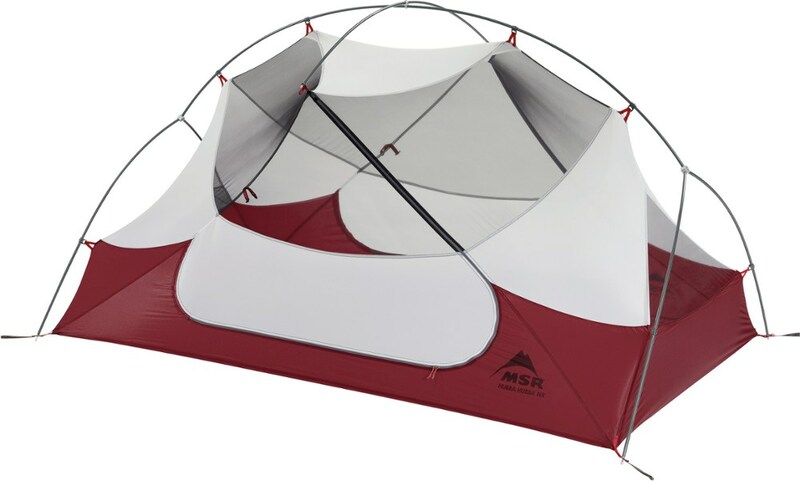 I first bought a Sierra Designs Clip 3 but after one trip the zipper on the main door broke and I hated having a tent that was not free standing. I decided to forfeit some weight for LOTS of added room. The Gunnison was a great choice for me. I don't do much backpacking but do go paddling as well as some car camping. For the money there isn't a better tent out there. The full coverage vestibule is great. It's a little cumbersome getting in and out with the way the fly is set up but other than that there are no flaws with the design. My last trip to the Boundary Waters was miserable weatherwise. It poured on us for 4 days straight with winds gusting well over 30 mph. The temp at night got down in the mid 40's. We stayed bone dry and warm and the tent was very stable. The double doors make it easy for two people to get in and out of and the gear loft is a bonus. Great tent. 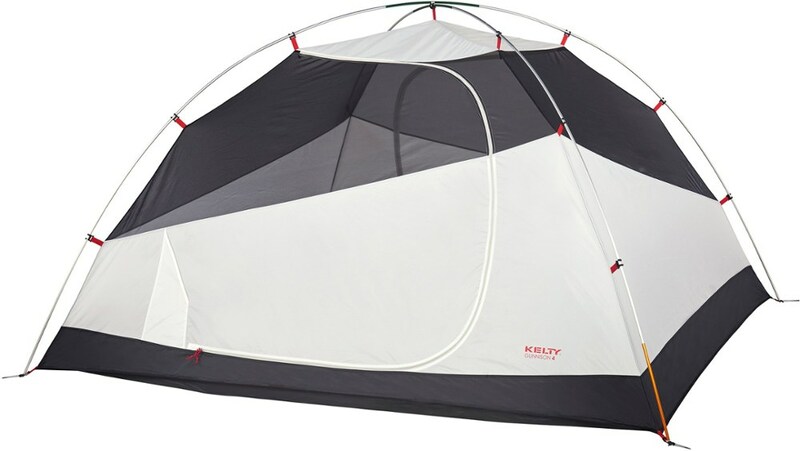 Since 1999 I have used a Kelty Vortex 4. It's the exact same tent different name. I used my Vortex 5-6 times a year with complete satisfaction. I have weathered some ugly storms including a tropical storm off the Gulf Coast. Sadly all good things come to an end. This past fall I was camped under a large tree - home to a dozen or so buzzards (unknown to me). Early a.m. a buzzard took flight pushing off and breaking a limb thirty feet above me. Needless to say a tent can only be so tough. A 4' long 6" wide tree limb from that high up will be the end to any tent. The good news is I have replaced it with the Gunnison 4. I can not see any real changes between the two. It's the greatest tent you can buy. Convenient, light, and built to last. 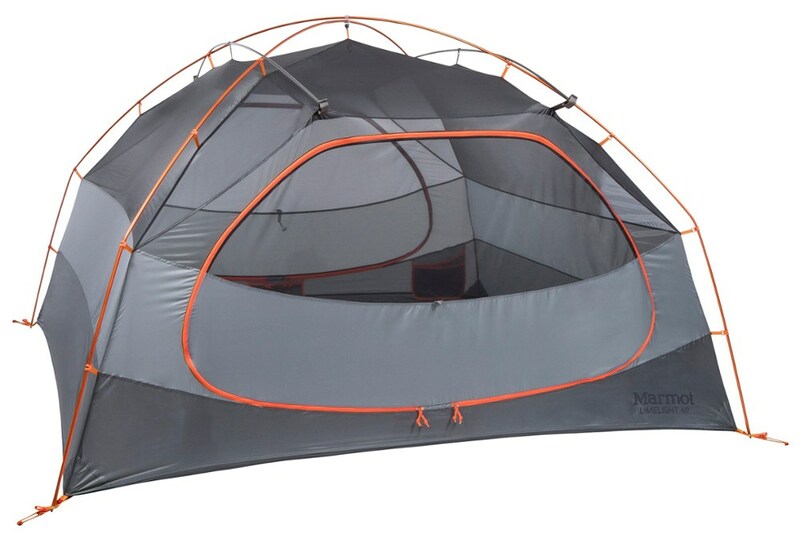 This tent is ideal for two people. Set up is an easy one person operation. Instructions are basic and don't cover use of the foot print, guy lines, and proper tensioning of the tent fly. First timers will have a hard time getting the best out of this tent. Ventilation is excellent. Vestibules are small due to lack of headroom. This tent would benefit from a third pole to support the vestibule peaks. Good tent, I'm happy to have it. It's affordable, large enough for my family (me, wife, and two kids), and at 8 pounds, it's light enough to backpack or portage. Inside feels roomy, it's bright and has great ventilation. The doors are big and it's easy to get in and out. The gear loft is great. We haven't used the tent in inclement weather (lucky us), but if I was expecting bad weather I'd take this tent without reservation. One thing about this tent that doesn't quite work for me (and there haven't been that many) is that the vestibules don't hold more. If the vestibules had their own poles they'd hold a ton of stuff, but of course, it wouldn't be an 8 pound tent then either. The vestibules stretch tight from the apex of the tent, and they swoop very low against the ground, offering minimal room for your pack. I imagine a 30 pound dog wouldn't be able to turn in a circle before laying down. With regard to fragility, like so many other tents on the market, the large amount of mosquito netting saves weight and improves ventilation, but I'm forever worried that my 3-year-old son will bounce right through it, or rip the netting along one of the zipper seams. We've made it through one summer's use, I'm hopeful we can continue without incident. Buying such a lightweight tent with small kids was a calculated risk, but I just try to keep the kids out of it when they're not sleeping. That's pretty much where my worries of ruggedness end. When the tent is pitched and fully staked, it's very rigid, I wouldn't worry a bit about wind. Rain would have to be nearly horizontal to enter the tent through the side vents, though someone with a Gunnison 2 mentioned in his review that rain had splashed inside during a big storm when puddles formed around the tent, I imagine our tent would be vulnerable to this too. Regarding snow, I bet the tent could hold an inch or two of snow without difficulty, though as a three season tent, it would be a pretty cold place to weather a snow storm. There is one thing Kelty needs to fix: that's the buckles that holds the rain-fly in position. You buckle it like a Fastex buckle and cinch the fly tight by pulling a piece of webbing and you're done. But as soon as you zip or unzip the vestibule, the webbing that holds the rain-fly tight wiggles side to side in the buckle, goes slack, so you lose tension around the side vents. This could be the difference between staying dry and getting wet in a storm, and should be redesigned. I guess I can solve this problem with a safety pin, though I shouldn't have to. Overall, I'm happy to live with this tent's shortcomings, because Kelty has delivered so much tent for the paltry weight and low price. Update to review. March 3, 2006. The tent is drafty at the floor because of it's lower side vents. And with the fly zipped up, it's muggy up above. With a full coverage fly this may be unavoidable ... the two small vents at the top of the tent don't breath as well as they need to. If I had it to do again, I'd look for more ventilation at the top of the tent, less at the bottom. With that gripe registered, I'm still very pleased with the ratio of size to weight with this tent. It's sturdy in the wind and has kept my family dry in the rain. All this and aluminum poles for under $200! It's a great value. My niggle about the Fastex buckles working loose, I've learned to live with, btw. If I had designed the tent, I might have used shock cord and a hook there, but the way it's designed hasn't caused us any hardship.